Coming up in just a few weeks — a great benefit: The Funniest Celebrity in Washington Contest… and the great part about it — I get to be one of the judges. 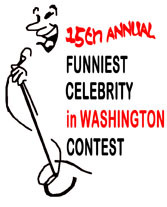 The contest is in it’s 16th year — and it is an opportunity for journalists, politicians, sports figures and other celebrities to compete for the title of Funniest Celebrity in Washington. * The person can not be a professional comedian who performs comedy for a living. The event features anywhere between eight and twelve celebrities, each performing three to five minutes of stand-up comedy. If they prefer to do a humorous skit or song, that is fine. WASHINGTON, DC – Washington’s most entertaining night just got funnier, as producer Richard Siegel announced more politicians, pundits, policymakers and general celebrities to compete in the 16th annual Funniest Celebrity in Washington Contest. The event takes place on Wednesday, September 30th at 7pm at the world-famous DC Improv (1140 Connecticut Ave, NW). Newly-announced contestants include Congresswoman Jackie Speier (D-CA), former Secretary of Agriculture and current President of the Motion Pictures Association of America Dan Glickman, prolific Washington-area restaurateur Chef Geoff Tracy and Washington Examiner Editorial Page Editor Mark Tapscott. They join political commentator Joe “The Plumber” Wurzelbacher, veteran contestant Grover Norquist (President, Americans for Tax Reform), Richard Miniter (Vice President of Opinion, The Washington Times), Count Gore De Vol (WDCA-TV), Anna Mulrine (US News and World Report) and Jeremy Ben Ami (J Street Family of Organizations) in competing for the title of Washington’s Funniest Celebrity. Also added to the show are special performances by the GEICO Gecko, star of nationwide advertising campaigns and Robert George from the New York Post. Former Funniest Celebrity champion Matt Cooper of Talking Points Memo, will also perform in a non-competitive set. Senator Ben Nelson (D-Nebraska) will receive a Lifetime Achievement Award from bringing good humor to Congress, as well as to his home state of Nebraska, where he served as Governor before joining the Senate. Baratunde Thurston, a popular Washington-born comedian and editor of The Onion, will serve as Master of Ceremonies. Former CNN Pentagon Correspondent Jamie McIntyre, WFED-AM anchor Chris Dorobek and WTOP-FM’s “Man About Town” Bob Madigan have been added to the list of judges. Previously announced judges include, Karen Tumulty of Time Magazine, Patrick Gavin from Politico, Margaret Carlson from Bloomberg News, Kiki Ryan and Jeff Dufour from The Washington Examiner, Clarence Page, a Pulitzer Prize winning columnist from The Chicago Tribune, and Nora McAlvanah of The National Journal will lead an all-star cavalcade of judges for the event. Legendary ABC news anchor Sam Donaldson will throw out the ceremonial first joke. Proceeds from the event will benefit STANDUP FOR KIDS, a 501(c)(3) not-for-profit organization founded in 1990 to help rescue homeless and at-risk youth. With national headquarters in Atlanta, GA, STANDUP FOR KIDS is run almost entirely by volunteers. For more information, please visit www.standupforkids.org. For more information about the Contest and tickets, contact Richard Siegel at (202) 250-9193 or visit www.funniestcelebrity.org or www.dcimprov.com.